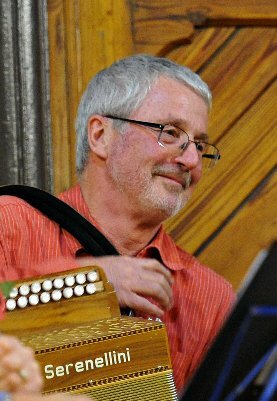 First appearing on the Oxford folk scene in the early 1980s, Dave became immediately influential for his powerful, highly-rhythmic style of melodeon playing. The fact that he was also a fine singer and dancer served to cement the high regard in which he was widely held. He danced with Oxford City Morris and Ducklington Morris during those early years, then, in about 1983, became (in a duo with amplified guitarist Jon Moore) regular musician for Rogue Morris, a female side who evolved the interpretation of the dance style from the Welsh border country into new and exciting heights. He had a long vocalising association with Dave Townsend, the two of them early on forming a radical duo known as The Blades, and so down to his involvement as a vital member of Christminster Singers. When in 1986 a barn dance band was formed from players at the weekly session at Eynsham, Dave became the primary melody carrier. Over the next decade Geckoes cemented a reputation as one of the finest in the country, and it was a joy to have the original quartet (Dave, Caroline Ritson, Jon Moore and myself) reunited a quarter century on at Towersey Festival in 2011. Dave's complex and ebullient playing style has been immortalised on a number of CDs recorded by the band during the 1990s. In addition to these many facets of his musical talents, he was a fine historian, specialising in military history, which he put to good use as a member of staff of The Imperial War Museum for many years. He was also a warm and loving individual with a quick flashing smile, a hearty laugh, and a genuine interest in the doings of those who came into his orbit. He will be sorely missed by many, from those who were closest to him to the numerous admirers of his musical talents.